The Reina Oxford Traditional Radiator is beautifully engineered to add elegance and style to any room in your home. It features a framework of composite vertical columns surrounded by quality tubing that gives it a compact and streamlined look. It is graced with an attractive chrome finish that gives it brilliant lustre and makes it perfectly compatible with other decorative elements in your room. Additionally, this heating appliance gives off an outstanding heat output to turn cold damp interiors into warm welcoming spaces. High quality modern design valves from Reina. Please Note: Image shown is for illustration purpose only. High quality valves from Reina. Please note image is for illustration purpose only. The first radiator arrived damaged, however this was dealt with promptly and a replacement sent. The radiator will look great in my en-suite. The negative aspect is that i expected to receive what i saw in the picture. I did not realise that the bottom taps were optional extras, therefore the radiator remains uninstalled until the angled valves arrive. This was very disappointing. Item not yet fitted so can't comment on how it performs. However when the first one arrived it had a dent in the top bar, I called the customer services and it was dealt with quickly and with no problems. A new radiator was arranged and delivered within the same week with no extra charges. A great price also. Recommend based on customer service. Hi, Is this radiator available with the ability to have an electric element? If not is there a similar option? Thank you for your email. Unfortunately none of our Reina Traditional Radiators are suitable for Electric or Duel Fuel use, these are Central Heating only. 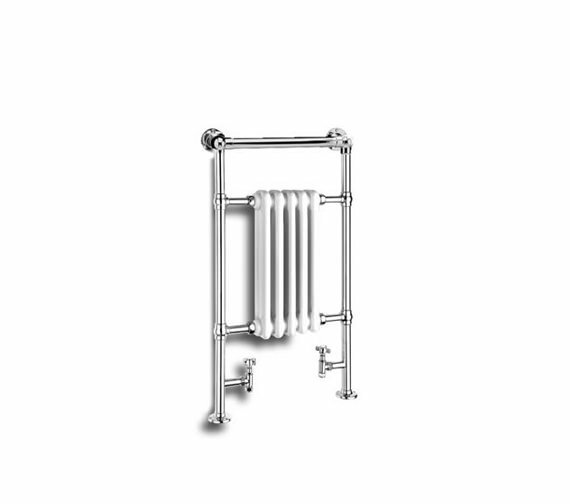 Hi, Regarding the Reina Oxford Traditional Chrome Radiator 538 x 960mm - RND-OXF01, how do you know if you need straight or angled valves? If you have the pipes going to the floor, you would require angled valves.